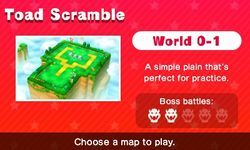 World 0 is the first set of boards in the Toad Scramble mode of Mario Party: Star Rush. 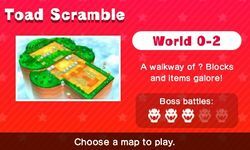 They are unlocked by default and include tutorial messages to introduce the game mechanics of Toad Scramble. 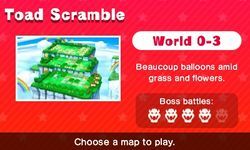 World 0 features a cliffside grassland theme. This page was last edited on September 26, 2018, at 08:56.